A year in the life of the world or a person may seem to be a kind of circle - starting in one season and ending in the same season. However, as we progress through the years this circle could more accurately be viewed as a spiral – while reaching the same season every year we progress through time. This Sterling silver amulet is shaped as a circle overlapping another circle, giving us a hint in two dimensions of the three dimensional spiral which can be used to describe the time and space continuum. The end of the inner circle is indeed like the tip of a spiral – pointing up to give us hope. The lines of the spiral are delineated in bright, smooth silver lines. 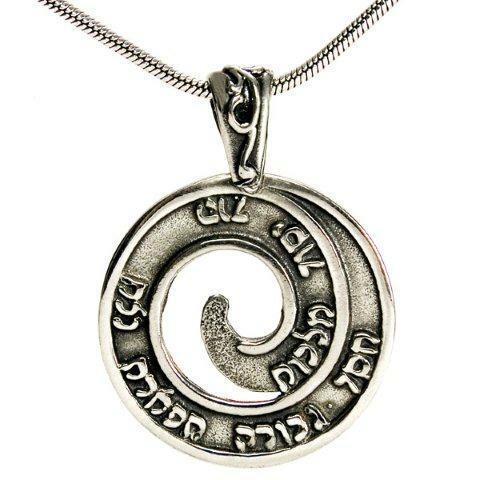 The inner surface of the spiral is a darker silver in a micro hammered texture, and the writing on this surface is a relief of Hebrew letters in smooth silver, like the perimeter. In Kabbalah, the ten Sefirot (Sefirah in the singular) may be described as the so called layers between the divine aspects of the creator and the physical reality of the world around us. The three higher ones are the ones closest to the creator, while the seven others serve as a conduit between humanity and the divine. The writing on this amulet specifies each of these seven Sefirot: The fisrst one on the inside is Malchut (&#1502;&#1500;&#1499;&#1493;&#1514;) – Kingdom. As we spiral outwards we find Yesod (&#1497;&#1505;&#1493;&#1491;) – Foundation, Hod (&#1492;&#1493;&#1491;) – Glory or Majesty, Netzach (&#1504;&#1510;&#1495;) – Eternity, Tiferet (&#1514;&#1508;&#1488;&#1512;&#1514;) – Beauty, Gevurah (&#1490;&#1489;&#1493;&#1512;&#1492;) – Power, and the one closest to the powers above is Hesed (&#1495;&#1505;&#1491;) – Mercy. The amulet is hung on its Sterling silver necklace with a silver link with a unique shape which widens at the top. A scrolled design is formed in smooth silver relief surrounded by the same darker micro hammered surface as the inner surface of the amulet itself. This sterling silver amulet from Ma'ase B'Omanut Jewelers measures 1 inch (25 mm). 'Kabbalah' can be literally translated to 'receiving'. You can select this amulet to address the specific needs of a friend or a loved one. When they receive it with its unique mystical powers they will, according to Kabbalah, receive success and courage for whatever they need to do in life.